CMDX is a elegant One-Page WordPress Theme, perfect for agencies, professional portfolio, business, photography, creative people or any type of creative websites. Easy Setup – Prepare your website within minutes by importing the demo data XML files packed with the theme. 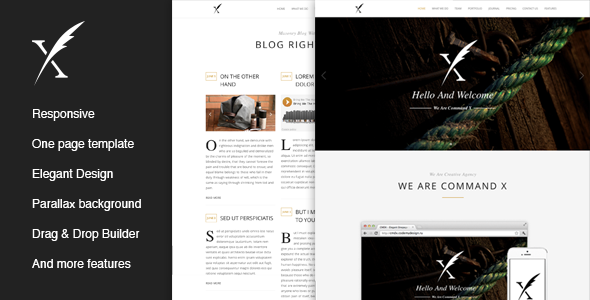 Responsive – CMDX looks great on small screens or fullscreen monitors. Premium Slider – CMDX included Premium “Revolution Slider” WordPress Plugin (save $19). Create sliders for your website within minutes. Drag & Drop Page Builder – CMDX included Premium “Visual Composer” WordPress Plugin (save $30). Create pages for your website within minutes. Powerful Theme Options – CMDX comes with easy-to-use options panel with more than 40+ theme options. Parallax – Add parallax effects for any content section. Easily managed via the page builder. Translation Ready – CMDX theme Packed with the .po files, which will help you localize the theme for another language. Search Optimized – CMDX comes with SEO optimized code. is also compatible with the most popular SEO Plugins. Post Formats – CMDX comes support most popular Post Formats (Standard, Gallery, Video, Audio, Link, Quote). Child Theme – CMDX Child Theme included into the package. Free Support & Updates – 24 hours / 7 day per week. Item Reviewed: CMDX Elegant One Page WordPress Theme 9 out of 10 based on 10 ratings. 9 user reviews.